Edward Malus (Nicolas Cage), a California highway patrol officer, finds himself on the reclusive island of Summerisle looking for a lost girl after receiving a mysterious letter from a woman from his past (Kate Beahan). Nothing on the island appears to be quite what it seems and as his search hits dead end after dead end he grows more and more desperate. A remake of the British classic, director Neil LaBute (“Nurse Betty,” “In the Company of Men”) has replaced the original’s themes of paganism versus Christianity with a battle of the sexes instead. Women rule Summerisle and men are used for labor and breeding stock and not much else. It’s not a bad idea as far as it goes, but by taking the religious element of the story out the pagan elements that do remain – notably the Wicker Man himself – lose a lot of their power. It’s more of an intellectual exercise than a story proper, and I suspect the filmmakers have seriously misjudged their audience. Malus is in the middle of an emotional breakdown of sorts brought on by his inability to save a mother and her child from a burning car. This, as much as anything else, is his primary impetus for finding Rowan, the missing girl; a way of putting his past mistakes behind him and starting his life over again, perhaps with the girl who hurt him years ago. He’s an earnest and astute investigator, but the past is keeping him from seeing the present as clearly as he should, such as noticing that everyone, including the woman who brought him out there, is incredibly vague about what has been going on in a way that is far too convenient to be believable (Beahan in particular seems to be stuck in “confused” mode for the entire film). LaBute has replaced the seduction of the first film with a general sense of bewilderment and loss, and it’s good for building tension but doesn’t fit with the payoff. The plot elements lead where they need to go well enough but don’t mix particularly well. It all ends up seeming thoroughly anti-climactic. It almost seems like it’s supposed to be a character study, which certainly fits with LaBute’s sensibilities, but comes off as mostly pointless. 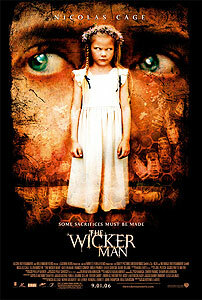 “The Wicker Man” isn’t that great by itself or as a remake. It’s not a carbon copy of the original, and some credit is deserved for that, but it just doesn’t work, either.